When you purchase an Abbey Fixed Angle Impact Troughing Set you can be assured of the highest quality available. These sets are made using the same heavy duty machined cast iron end covers, machined shafts, double rubber lip seals and sealed for life 2RSC3 bearings as the abbey variable angle troughing set. The side rollers are supported by an external side support therefore each side roller has a projecting shaft at both the top and bottom of every side roller. However, due to the abbey roller patented design and construction with the 2RSC3 bearing housed within the cast iron end cover behind the double lip seal excellent bearing protection is still achieved. Each roller drops into slots on the base frame. The side rollers are fixed (and cannot be altered) at a specific angle to customer requirements using the outside support. The centre roller is inline with the two side rollers. 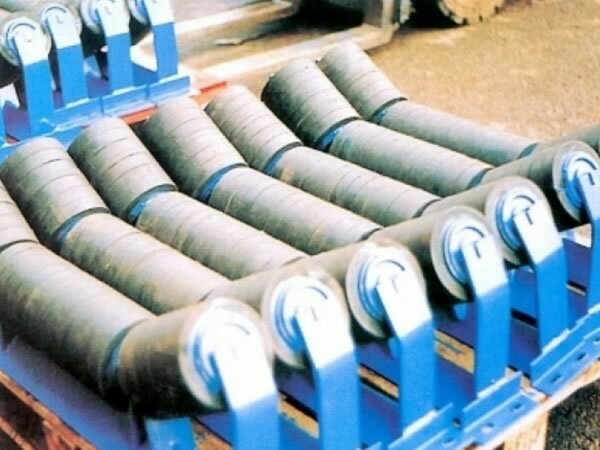 The rollers are manufactured from mild steel in 101.6mm diameter. A series of soft rubber discs of 152mm diameter are then hydraulically fitted over the steel pipe to cover the steel pipe completely and held securely in place by retainers welded at each end. These rollers drop into slots on the base frame. Fixed angle impact troughing sets can also be manufactured using 190mm Diameter rubber discs giving extra rubber thickness for higher impact areas. 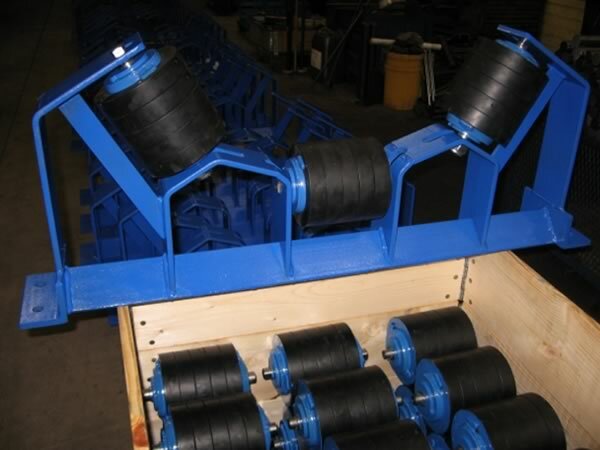 Rollers on the fixed angle impact troughing set can be made of equal length or to abbey roller lengths depending on the belt width. The Fixed Angle Impact Troughing Set is specifically designed for use in Impact areas.